Curious gamers have found in Metal Gear Survive an encrypted message – probably with the help of the developers showed that the game does not like it themselves. Recall, the survival action was announced back in 2016, and the release took place just the other day. Critics have already had a very negative reaction to the novelty. When creating a character, gamers are shown a list of soldiers with code names. The most attentive noticed that the first letters of the callsigns add the inscription “KJP Forever”. This is the studio Kojima Production, which for a long time engaged in the series and separated from Konami in 2015, soon after the release of Metal Gear Solid V: The Phantom Pain. At the very bottom of the list, one can also see a reference to the directors of the project in a negative context – they mentioned the director Jota Tsutsumizaki and the producer Yodzi Korekado. They, among other things, are listed as deserters (AWOL status). Recall, Hideo Kojima, author of Metal Gear, was fired in the same year 2015 – the name of the famous game designer and director even removed from marketing materials MGSV shortly before the release, which caused a lot of controversy in the community. On this occasion, a scandal broke out, after which some fans of Konami turned away from the company, and Kojima himself and part of his team went to free bread. 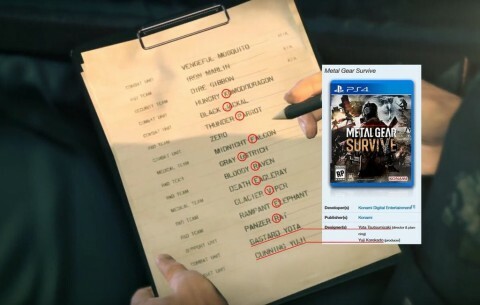 And although the hidden message looks plausible, given the situation around the MGS, it is worth noting that, quite possibly, this is a simple coincidence. Some users of the network have already started joking about this, looking for other (underlined absurd) messages using different letters. However, this is Metal Gear. In this series everything is possible. People with a huge and genuine IQ will always be there, thanks to fans for reviewing this secret messages. Good game. Nvidia Geforve RTX 2060 announced with impressive results!